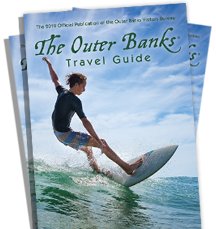 Whether you are a history buff, outdoor adventurer or admirer of architecture, take the time to rediscover our nation’s heritage on the Outer Banks. Today, you can visit attractions that celebrate our Elizabethan history, like The Lost Colony, Roanoke Island Festival Park and the Elizabethan Gardens. It was here, on December 17, 1903, near Kitty Hawk in Kill Devil Hills, that Wilbur & Orville Wright broke man&apos;s bond to the earth with their first powered flight. Visitors can experience the magic of that inventive breakthrough at the Wright Brothers National Memorial, and the spirit of flight remains alive at Jockey&apos;s Ridge State Park, North Carolina’s most visited state park, and tallest sand dunes on the East Coast-a favorite spot for hang gliding and kite flying. See the Bodie Island Lighthouse and the majestic Cape Hatteras Lighthouse, which stands at 208 feet, the tallest in the United States. These sites are among the many treasures found along the shores of the Outer Banks.